The hospital is a weird place to be starting a blog from…thankfully I am just here for my check-up. I just had blood drawn and now waiting for my Doc. 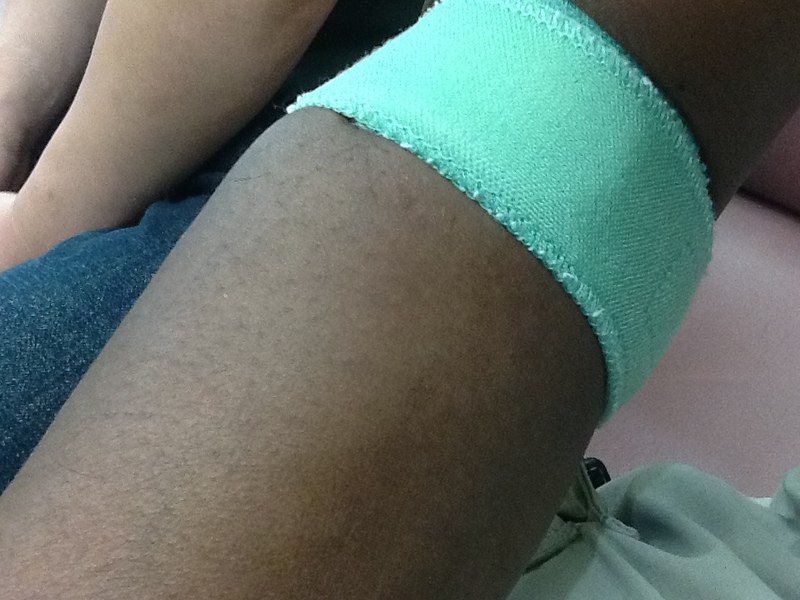 I hate needles, these people are pretty good, I hardly felt anything other than a slight prick. They give you this weird band to wear for a while to hold on the tiny band-aide. After I leave here, it is off to teach my Chan meditation class. I have been given the official blessings to teach from not only the leader in Taiwan but the board in Ca. Not really a big deal to any one but me and considering I am the only Child of Africa blood line to be so entrusted. It is a big deal on a small level. Anyway afterward it will be lunch then off to do yard work for Aoki Sensei. it maybe the last of his yard for the season. The little extra money has been nice, however it is a bit tiring to go. None of which this post is about. The band, we had our first official gig this past Sat. Yup a real “gig” with pay. We played at a Small club/bar called “Chicago Rock Blues and Soul bar” this was my third time playing there, the other two times were just sitting in with the band. This time I am part of the band. We worn our newly designed, by me Band-wear T-shirts. I was surprised they were ready in time as it was just pulled together at the last moment. The gig went pretty well, it was a loose feel to the evening. There was not a big crowd, but enough people that we got paid. Here the group get a part of the door fee. We did a warmup-semi jam then went into the planned songs. It was fun to play some extended pieces free style. Surprisingly it went better than I thought even with no real practice and three songs with no practice at all. Prime example”Watermelon Man” we did a version with the guitar player playing a verse and me singing a verse, we switch back and forth, vocal and guitar. Then at the end, whilst trying to figure out an ending the drummer changed rhythms along with me and we did a jazzy swing. It sounded pretty cool! At least live it did, the tape audio is funky! The drummer and I switched up beats on several songs to give some variety to the standard blues. I was really our first time seriously playing together. The only bummer for me on the evening was I wanted to record some audio. I had two recorders with me. One, the good one, did not function well. I think the power draw was too much for the rechargeable cheap battery. It turn on and started to record but, cut off shortly after I stop paying attention to it. I changed to my iTouch/iPod. It worked well however the sound sucked as it was too close to my Bass. Well now I know for next time how to set things up better. I did manage to piece together a couple of video/audio tunes so I could judge how we sounded. I was told by the band leader, he wanted me to sing most of the songs. I gave more appeal/advantage to the band. Of course. Doing Blues/soul music with a real Black American playing and singing, gives the band a better distinction than an all Japanese band, trying to sound soulful. I do have to say a couple of the singers I have heard do a good job of copying the old Blues singers. Some other not so much and the words do not make sense. As LZ and I expected for once my color gives me some advantage. In the States I am just another singing Bass player, here being the “token” equals work. There are a lot of good blues bands in the area, some even have “Gaijin” but none with a Player of Color. We have another club date there in Oct, at the Chicago Rock. Along with another planned spot back in Kobe for another benefit show. This time for some kids in Katmandu. It is a pretty big club, with generally a fairly large turn out of musicians there for the Jam. This is were I first met the current guys I am with, plus some others. I am looking forward to going back there, more so now that I am with the band and we have a style and material. Another plus to that is we understand the use of sound dynamics and not just playing loud, as what generally happen with a “jam” of just people gathering to play. It should be interesting as we will have another friend sit in on the Bass, whilst I do Keyboards and maybe a Sax player also set in. Tenor Sax is not my favorite sound, but it does give a different depth to a song. There is some talk on an invitation we received to be in a large Blues Show in Kyoto in Dec to promote “black” music. No money, but it could be fun and exposure, as well as interesting for me meeting new people in a different venue. 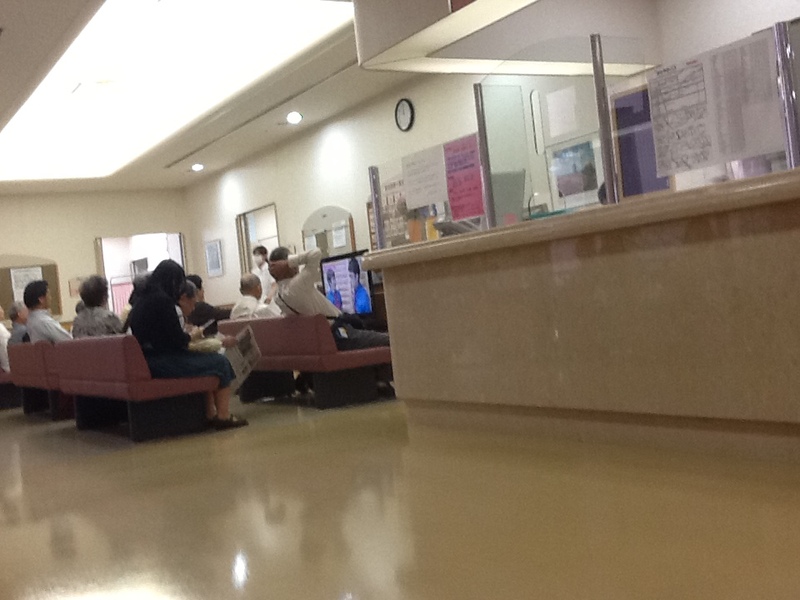 The hospital is crowded today. I hope I will not be made late or miss doing my class. I guess I am waiting for my lab work. Ahh, there was an emergency down at the ER, so everything is backed up. However I am done now, saw my Doc and am waiting for my regular prescription. 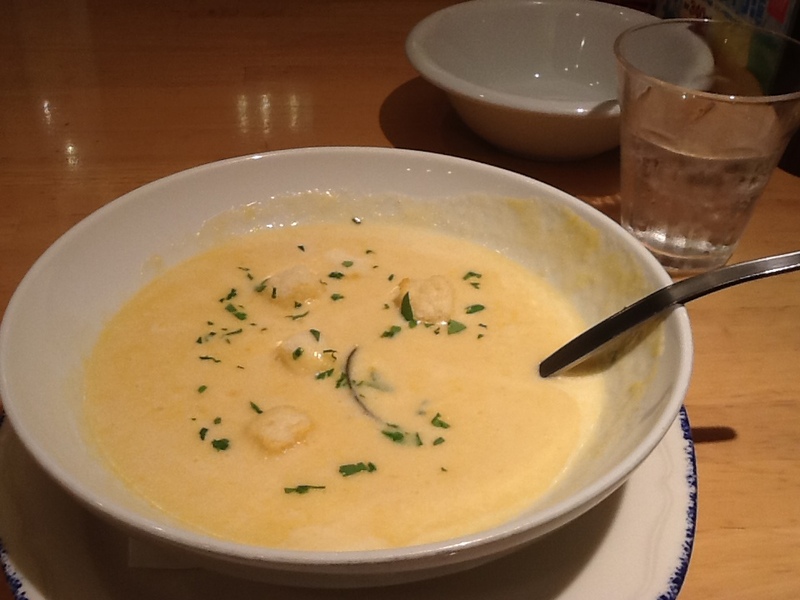 Celebration lunch for my first music gig. it was good. 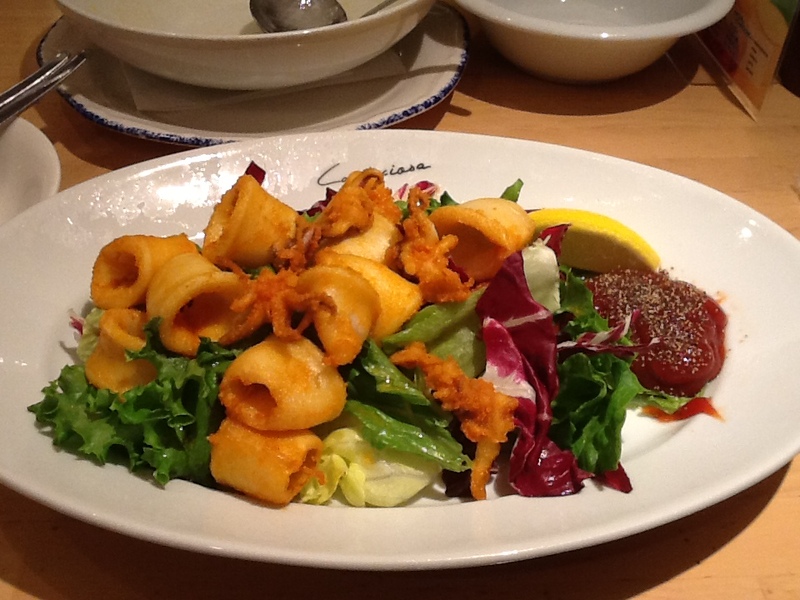 Corn soup, calamari salad. On Fridays I have a Japanese class. It is basically free, handled by volunteers. It is set up kind of different. It is mostly a one on one class with a sensei and a student. The session is tailored for the needs of the student. There is a woman from Bulgaria, One from Korea, one from China and me. For each of us there is a Sensei. Everyone, EVERYONE speaks what seems fluent Japanese to me. All the conversations are in Japanese! I miss most of it, I catch enough sometime from piecing together things what is going on. Sometimes I have NO idea! Later I am told or I figure it out, or just miss that part. These are the group talks I am referring to. From time to time there is tea and cakes and just chatting, no real lesson for me. I do feel lost sometimes. Everyone there is nice, and a few speak some English. The Chinese woman is recent although everyone seems to know her. So she must have been there before my time. She knows I speak a little Chinese. It was kind of funny as little as my Chinese is, the other day she was saying something in Japanese some word for flower, that I did not get. She said it in Mandarin and I got it. When she first came back to class we were discussing some Basic Chinese terms to the group and I kind of helped explain them Japanese to English comparisons. As I said some of them can speak some basic English. This past Friday class there is a big discussion over tea and truffles brought back from France by the Bulgarian woman, about me teaching/ helping everyone there with English. I did not understand most of the discussion. I repeated my thoughts on my limited Japanese skill to help with teaching English would be difficult. Again the response was you are a native speaker, you can help with correct pronunciation. Now things got a bit complex, because the Chinese woman needed one thing from the English help the others wanted something else. As I am there getting free lessons, I felt some responsibility to help and I like them all. It was worked out that one Friday a month I run an English group session for everyone interested, which was all except for one woman. for the Chinese woman I will come in one hour earlier to help her. I am unsure of that is to be every Friday or just that one Friday. I will need to find out. Either way it is kind of payback and I guess in a round about way it will help me with Japanese, I think. Maybe even some Chinese improvement. Which I do not really need now a days being in Japan and all. Anyway so after being here over a year and one of the few foreigners not teaching English, reluctantly I am an English teacher…sort of. I have been getting some practice in at least once a week. For the most part it seems to be going well. My hit ratio is up, even with put keep an official track of it like I was before the shinsa. Just knowing that I get generally two out of four shots…mostly. Of course I still receive corrections, and most time my hits fall off after that. Normal, since then I am thinking about the correction not so much hitting. I am back not to thinking more about my form rather that the hit. Like when I first arrived at the dojo. Basically doing basics. I know I can hit, most times. Now I need more details in place, inner and outer. I went to the dojo this past Thursday. I arrived just before end of lunch as I usually do. I was on the floor when the Senseis’ ( what is plural for Sensei?) came back from lunch. I was called over and told to get ready to accept my certificate…basically. I was taken over by the Kaicho to a spot, the other Sensei and couple of sempai lined up behind them. The certificate was read and then handed to me. It was all quite informally formal. Nice. I turned and thanked everyone for their help ( and others not present) in making this happen. I know it would not have been so without their help, I was quite grateful. I have my other certificates but this one I have framed and hung on the wall. I had to really work for this. I worked for Shodan also, but differently. NiDan not so much. SanDan I really put in the effort. There is a bit of pride when I see it hanging over the weapons alcove in the studio. I have figured out I can attend the Yon-dan Shinsa in Dec., however I decided to wait. Part to do with money. Registration is in Oct. I am having my family Mon put on my Kimono, that costs, my Renmai chapter dues will be coming up soon as well. That added to some family stuff says I should wait, to keep peace in the house. Besides it gives me more time to prepare and there is no need to rush. It will be a big personal milestone, but realistically little more than a pride boast. So therefore some self-discipline and restraint is good. Before Nidan there was commitment and practice, after NiDan there is commitment and practice. 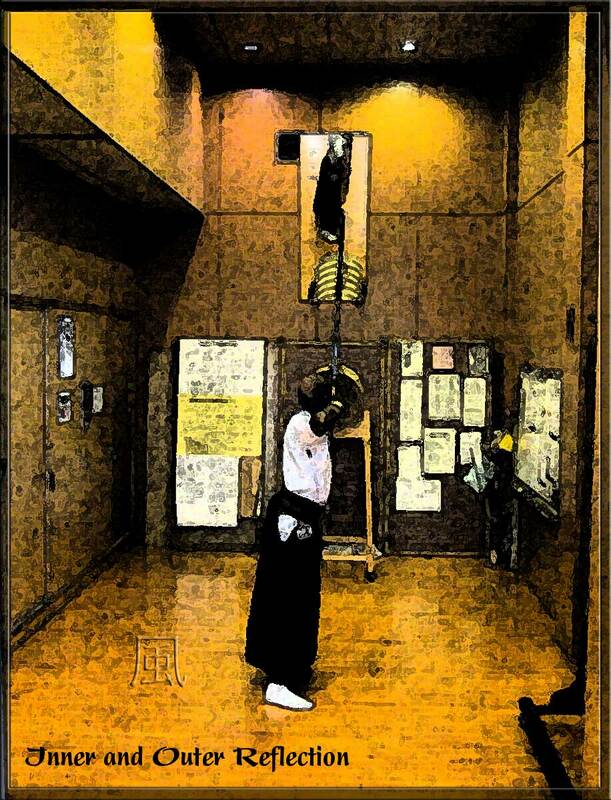 It has been a while since I took the bike the 1.5 hr ride to Kyudo, due to the summer heat. Yesterday with the weather no changing I went for it. I took my time and went slow. Even though I ride everyday almost somewhere it is the distance here that is the factor. Actually the ride there is easier than the ride back. As it turns out it took way longer than I planned. I stopped to check on having T-shirts made for the band. Then checked on a place to have the family “mon” embroidered on my Kimono. I had the address of the place and directions, but was not quite sure since the sign was in Kanji and LZ who wrote the name, here kanji is at times hard to read. I asked a random person on the street once I was, I thought near the place. This guy and woman pointed to the building just down the street. I guess they could tell I was not sure which one they said, because the guy runs along side my bike to show me just what building it is, then comes back after a few minutes to check on me when he sees me hesitant about crossing the street. I was just checking out the place as it looked closed and looking for a street crossing. Even after over a year here I am still surprised at some people’s kindness. Further on up the road I encounter the start of the mass of people going to the Kishiwada festival. it is a BiG yearly event and being held this weekend. The crowds got bad at one place a needed to go through to get to the Dojo. I unmounted my bike and planned on walking through this throng of people. Another Obachan going the other way also did the same, we waited for a break to pass through. Once in close she smiled and started a conversation. I always find that surprising. So after much side stepping and side route adjustments due to the parade path, I make it to the Dojo. I am expecting the usual group however there are some new people there and they are being filmed. It turns out there is a NHK film team doing a film for Youtube on an upcoming TaiKai. There are three Osaka champions competing, or maybe two and this one sensei. Something like that. It seemed the Sensei was the main focus. Of course i did not understand the whole thing, just pieced together a story from the bits that I was told. I did also find out, was told there is a monthly DaiKai held each month at the monthly Dojo meeting. I was asked if I was attending this one upcoming. My San dan certificate will be handed out at this meeting, however I will be working that day. not a problem I was told. I have already seen it, I just have not been given it as yet. As far as my shooting. I am improving but there is still so much I need to adjust. Especially dropping my shoulders and opening up more in Kai and Hikiwaki. I feel like I am open but I keep being told I am closing when I shoot. I will need to working on a method to combat that closing action. I am back to correcting my form and not so concerned about hitting. I can hit when I just shoot. I will start attending these monthly competitions for the stress/ pressure practice. Spring is coming. On the trip home I thought the festival stuff would be over. I was wrong and again encountered the crowds. This time around I took in some of the atmosphere. There were a lot of booths, and people even foreigners which I am not used to seeing or hearing. It has been about 2.5 mos now working at the Silver Center. It maybe less but it seems like more. It is draining physically. With the heat and the last several jobs have been clearing hills sides. With climbing up and down, raking, bagging, loading the truck, wheww not pleasant for an old guy just starting this kind of work in his retirement years. For real not what I had planned. I have been joining the group with naps at lunch time. Today, we ate then everyone finds a spot in the shade under the tree and sleeps for 30 minutes. That part goes too fast. I am grateful, without doubt for the job, but I certainly do not look forward to Tues and Weds, my days to work. It is the happiest moment when it is time to go home on Weds. I think , whoohoo, I made it again!! Yatta!The days I work afterwards I am pretty useless when I get home, I just want to shower, eat and sleep. I am hoping as the weather cools and I get more used to this, things get easier to bare. I wonder what the sempai that do not seem it be effected and do this everyday handle it. Not all of them have been doing this all their lives. One guy the other day was showing me how to tie a knot correctly. He was very patient and helpful, he said his job before was something to do with ropes, that is why he knew about knots. I did not understand just what he was saying but I got that much out it. So, anyway the last two weeks have been at the same location. We have had to clear growth from around a man-made lake or reservoir of some sort. The hill-side was at least 45 degrees angle at most places sometimes more. Sometimes the guys had to tie a rope on themselves to walk and cut with the trimmer/cutter. Then I would go behind them and rake the cuttings. These cutting are not like grass, I am talking, bamboo and the like. Grass that is 3-5 ft tall. Once I gather it into groups, these are tied with a line that has been lowered, then hauled up the hillside and loaded onto the truck. I forgot to bring my camera. What I need is a tiny digital easy to pocket one . However not worth the investment, what with the small readership here of two or three. Anyway, it is not a bad job, just tiring, the local are nice. The summer heat makes it a bit brutal at times. A few weeks before that I had a day we went around collecting dead flowers and offerings from the local cemeteries. That was kind of nasty. The decomposing flowers and fruit in the summer heat. I was expecting to see a rats, but thankfully did not. However on the last stop, there were some serious big roaches!! Yuk! Yuk yuk! So glad for my rubber coated gloves, even then I did not want to touch stuff. I had to force myself to get over it and just take care of business since I was all covered from head to toe. Life is full of change, to survive one must adapt. These days of what seems to be a spiritual darkening, not a new age of enlightenment, it is even more important to maintain ones center and adapt. All those years of putting myself through college, having a decent job, at one point my own office, 25.00 an hour, designing, sometimes a manager, all that is history, nothing but a memory. This is a new time. The condo, the boats, sports cars, nice while it lasted. Now collecting garbage, raking weeds, worrying about falling off the side of a hill into a drainage ditch is the present. Not the retirement life I planned, certainly retirement gone awry. Still I am living in Japan, healthy, fairly comfortable and doing for the most part what I wanted. Teaching Chan part time, teaching sailing part time, practicing Kyudo, reaching San-dan, a good life mate, joined a band. Many only dream of this good a life life. Things do not give true happiness, things come and go. It can be a blessing to be an old man peacefully (and safely) napping under a tree. I looked at the sky through the marvel mazing of the tree branches and gave thanks. In the music world back in the states, when one, an artist says they have a gig, it generally means they have a paying job. Now-a-days I hear regular people say it, it kind of bugs me. Like they are highjacking “our” lingo, 9-5 ers, get your own words! Ok, so here in Japan I am guessing there is a bit of lost in the term. I was told by the band leader “I have a gig and would like you to play with me”. I am thinking, cool some pay for playing, a paid music gig in Japan, cool! No, it was a freebie. A nursing home so it is ok, good karma, and practice. I gather my gear, including the new to me amp I purchased to use for this “gig” since I had heard there was no PA, and my serious club amp was too much and too heavy for this venue. Also I took my lighter acoustic bass. So all this is easier to deal with having to travel via train. Hopefully the purchase will be a worthwhile in the long run. It did work out fine for this event. Out of this I discovered a new battery powered mini Bass amp with some serious thump. It is perfect for travel, outdoors, and small clubs run through a PA if needed, like what is here in Japan. Anyway, I digress. I got on the train to travel, as one does here in Japan when sans-car. I had my first ride in a full electric car. “M” the leader gave me a ride from the train station near his home. The car is nice. Him and his girlfriend got excited to see another “leaf” at the stop sign on the way to the event. We arrive at the hospital, and head to Dr. “M”‘s office. There is a sign on the door. This our temp “green room”. The band’s HQ so to speak. It is a nice setup. We have tea and relax. The hospital gives us vouchers for food and drink. Cool, this may have been our Pay. We eat, chat and wait for the other “M”, the drummer. He arrives a short while later and we go through a couple of songs before go down to the show. After a short while we get the “curtain call” and head down. There is a fair amount of people and there is a stage setup. Things are much more organized than we thought. We had a PA system and a stage, I thought cool! I was told we would be standing in a parking lot basically. We started on our first song, it was bad! I could hardly hear what Dr. M was playing and what I heard sounded distorted and off. About half way through i was able to link in. The second song went much better. I though a bit to uptempo and hip for this crowd, but at least we sounded better now. By the third song we were fully functioning as a band. However I had an issue with my harmonica brace. It was not set tight. So as I played it keep falling/slipping down. I dealt with it best I could. For the next song I did not sing so I was able to play single notes with one hand and make the needed adjustment to the harp holder with the other. Ok finally I was set. I finished that song and was ready for the next, which was next to the last. Finally we sounded pretty good and all things were functioning as should planned. The link to the FB vid is here if you can access. This was really our first time playing together as a whole. I have played with the other two separately, and they played with each other, but the first time for the three of us. We had planned on doing this at the last Blues for Kobe Jam, but with former “star” Paul Jackson there things did not go as planned. For the last song we did a traditional Japanese song. That got the most applause from the crowd. Once that was finished we hustled off stage so the next performers could have at it. From the smiles and remarks given to us as we left I am guessing overall it went well and people enjoyed the music. Maybe not all of it but enough, or grateful for just the effort of coming out for them. Our next performance is at a club end of this month. We should sound fairly decent then. It is a small comfortable venue. We are slowly getting a song list together. I am hoping for some different tunes from the mass of other Blues bands here. So our distinction will be not only the American of color singing, but some cool tunes, unlike the other Bands. It would be good to develop a following and get some actual “gigs”.